If I tell you that investment banks way of making you rich is advising you to “Buy high and sell low”, you’d call me stupid, you’d think I got the sentence wrong (obviously the way to become rich is “buying low and selling high”). Take a look at the chart below. It’s taken from an investment bank report of EADS at the end of 2007 (let me omit the name of the bank out of courtesy… nevertheless, all banks incur in the same vices). 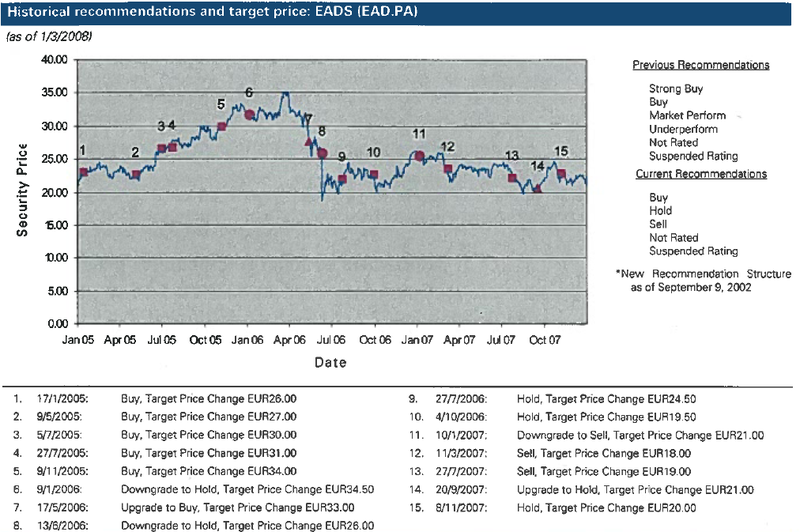 EADS historical prices from 2005 to end 2007 and investment bank's target prices and recommendations. Along almost 3 years time, the bank recommends you to buy at 6 different points in time with prices ranging from 26€ to 34€. In the same period it recommends selling 3 times with prices ranging from 18€ to 21€. That is indeed buying high and selling low. Each time that the bank recommended “Buy” the stock actual price was just between 7-16% below the bank’s estimated target price (e.g. 31.5€ vs 34€, -7%). Benjamin Graham concept of “margin of safety” advises you to invest only when the margin between the price you’ve estimated as the stock’s intrinsic value and its current price is above 30%, otherwise possible errors in your judging of the price will eat away possible gains. That was regarding the margin of safety… was the intrinsic value of EADS really 34€? I have checked statements of EADS several times since its creation. I have never come to that figure as its intrinsic value. Even discarding all the one-offs that have occurred in the last years, the conservative price I reached never went upper than 24€ (a price reached at some point in 2011 – when I sold my stock). That means that the stock would have been a “buy”, had I been the banker, only when its price was under 17€ (which was never the case in the period shown in the report – but for a long period afterwards). Nevertheless, today’s 45 euros is 45 euros. I genuinely admire your willingness to put intellectual rigour ahead of ego! But buying EADS the day after the market’s absurd reaction to the BAE announcement was a “no-brainer”.